WASHINGTON – President Donald Trump declared “DACA is dead” in a series of tweets over the weekend, blaming Democrats for the failure to find a replacement for the deferred deportation program that he said last fall he would rescind. The tweets also blamed Mexico for failing to stop illegal immigration into the U.S. and urged Republicans to “use nuclear option” in the Senate to bypass Democrats’ ability to filibuster immigration legislation. But immigration advocates brushed off the comments as little more than “just another stream of angry tweets” from the president. They said his demand that Congress “pass tough laws NOW” was “extremely unlikely” to happen before this year’s midterm elections. 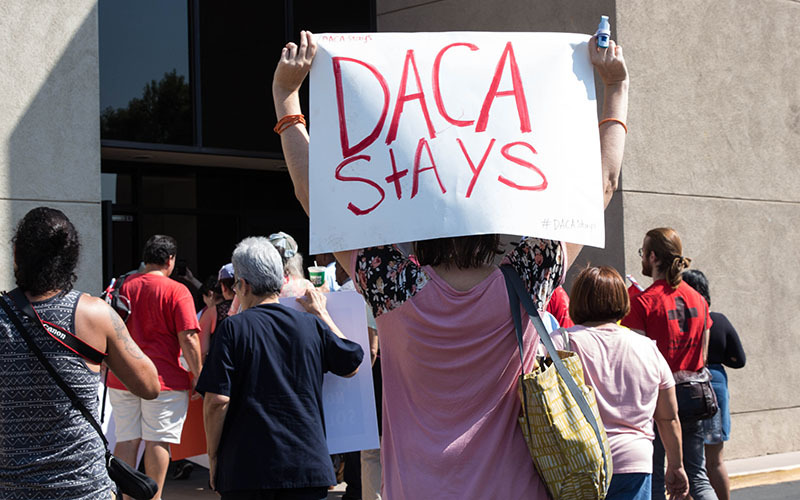 They also noted that DACA itself is still being kept alive for now by courts that are hearing challenges to the administration’s decision to end the Obama-era Deferred Action for Childhood Arrivals program. Calls seeking comment from Republican lawmakers and immigration enforcement advocates were not returned Monday. Since it was enacted in 2012, DACA has deferred deportation for an estimated 800,000 immigrants who were brought to this country illegally when they were still children. Critics at the time called it an overreach by the Obama administration, an argument the Trump administration used when it announced Sept. 5 that it would “wind down” the program over six months. Trump said the six months would give Congress time to come up with a replacement, and he said earlier this year that he would “deal with DACA with heart,” promising negotiations across the aisle. But Congress has not been able to act, despite a range of proposals from both sides of the aisle. Trump, who once said he would sign any bill lawmakers presented him, later demanded that any deal include funding for border security and a border wall. The program was set to end March 5, but federal courts ordered the program to continue while they heard challenges to the rescission. That took pressure to act off of Congress for time-being. “Legislatively, even before the president’s tweets, we knew that there likely would not be action towards the program until after the midterm election, if any,” said Sarah Pierce, a policy analyst with the Migration Policy Institute. 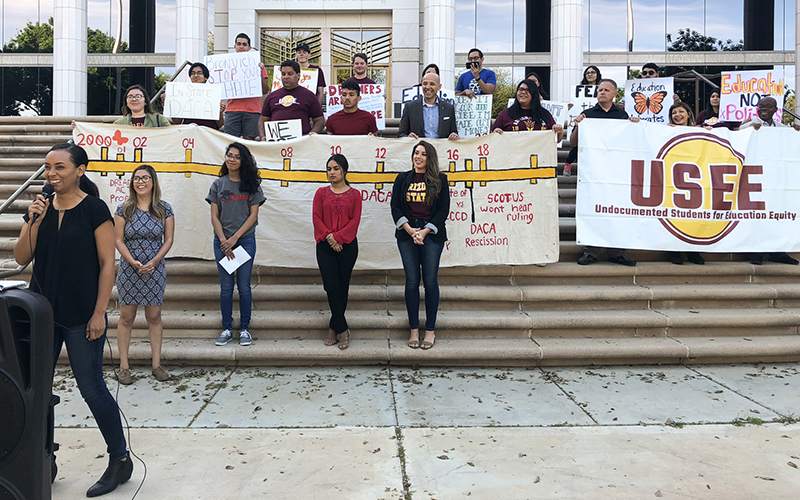 “Nothing came out of DACA negotiations in February, and the closer we get to midterm elections in November the less likely congressional representatives and senators are to negotiate on this issue,” she said. Pierce said the legislative failure on DACA is still “fresh in the president’s mind,” And she thinks that Trump’s tweets were spurred by that and by recent reports that a caravan carrying Central Americans is heading north to try to cross the border. “It looks as if his attention is drawn to the fact that there is currently a caravan of migrants making their way through Mexico, Central Americans who are mostly Honduran and whose intentions are to try and cross the U.S. border,” Pierce said. The Trump administration referred to the Central American caravan in a statement Monday that blamed “porous borders, legal loopholes, and insufficient immigration enforcement resources” for the influx of illegal immigrants. “In the absence of lasting solutions to the problems that riddle our immigration system, we can only expect the flow of illegal immigration into our country to continue,” the statement read. But Pierce said the caravan reports and DACA legislation should not be linked. “In order to qualify for the DACA program you have had to have been here in 2007, so none of the individuals in the caravan or who come into the country illegally now would even qualify for the program,” she said. “Trump is telling blatant lies to support his anti-immigrant narrative and justifying his heartless decision to end the program in the first place,” his tweet said. Petra Falcon, the executive director of Promise Arizona, a Latino advocacy group in Phoenix, called Trump’s tweets “unprofessional” but not surprising. Tobar said Trump “needs a reality check” for the lack of progress.